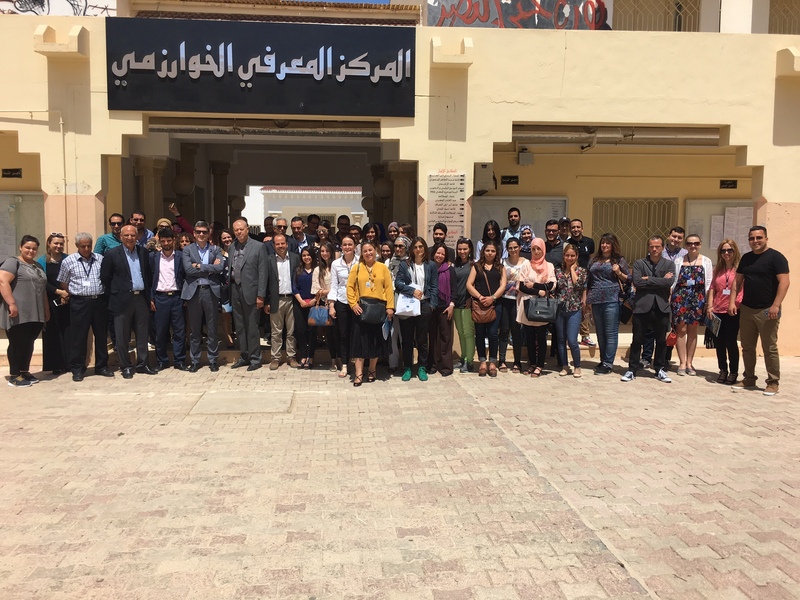 On 22 and 23 May 2017, the University of Sfax hosted the final workshop of the cross-media journalism master project. The project, aimed at students and young journalists from the Universities of La Manouba, University of Sfax and University of Sousse, spanned from December 2014 to June 2017 within the framework of the eMEDia Project, coordinated by UNIMED and financed by the TEMPUS programme of the European Union. The Tunisian and European Universities involved in the project, as well as all the members of the Consortium, took part in the closing meeting and final workshop in Sfax. The meeting has been attended by the Institute of Press and Information Sciences (IPSI), the Faculty of Language and Humanities of Sfax, the Faculty of Languages and Humanities of Sousse, the University of Tampere (Finland), IULM (Italy), the University of Barcelona (Spain), UNIMED, the Ministry of Higher Education and Scientific Research, and the Sfax Section of National Syndicate of Tunisian Journalists (SNJT) as professional partners. This last event has closed a series of planning, reflection and evaluation meetings, which have been held in turn in the different European and Tunisian Universities involved in the project. The Consortium partners hold a technical meeting on the 22nd of May, and a final workshop on the 23rd. This workshop targeted all the stakeholders of the media scene and the civil society members interested in this Cross-Media Master Project and in the teaching of cross-media journalism from a Euro-Mediterranean perspective (academics, administrative offices, managers, students, professionals, associations). Approximately 87 students from two different years from ISPI and the Faculties of Languages and Humanities of Sfax and Sousse were enrolled in the first and second edition of this professional Master Programme, considered a pilot in terms of inter-Tunisian university cooperation in journalism teaching, and a success story in terms of exchanges with European universities and openings on the professional world. The main goal of this multilateral cooperation, when it was launched in June 2014 at UNIMED’s offices in Rome, was to contribute to the improvement of higher education in Tunisia in the context of a partnership and an exchange of know-how between Tunisian universities and European universities. This project was a great opportunity to lead a unique experience of transversal, inter-Tunisian academic cooperation. This is in fact the first time in the history of journalism teaching in Tunisia that universities with various specialities share knowledge and teaching methods. The students of this Master, from the universities of La Manouba, Sfax and Sousse, have been able, for two years, to draw upon the same source of knowledge. They will also have a single diploma, which will allow them to approach journalism with its new requirements: modern, ever-changing, multi-support press. The eMEDia students are constantly asking the partners and initiators of the project to ensure that the experience, to which they have adhered massively (large number of candidates for the pre-selection), goes on. Moreover, at the closing ceremony of the Summer School, which was held at the Italian University of IULM on September 2016, the students reiterated their desire to see this Master programme continue. Their also repeated their wish to develop the Tunisian-European partnership experience in this project so that it can open new horizons for participants wishing to pursue their studies, find real job opportunities and gain experience in cross-media journalism, both at local and international levels.